Infant Massage instruction provides a form of communication which sets the emotional dance between caregiver and baby to continue throughout life. What parents learn from infant massage is communication through touch, eye contact and asking permission to touch their baby. Parents also learn how to read their baby's body responses. 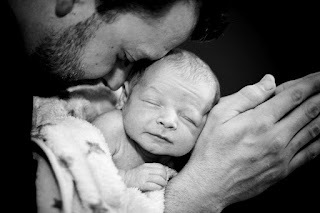 The most attractive benefit of massage to new parents is the relief their baby experiences from colic, gas and stress. Parents notice how much more relaxed their baby becomes and how quickly they fall asleep after being massaged. Other benefits infant massage provides are: stimulation of all of the physiological systems, increased circulation, increased immune systems, stimulation of mylenation of brain sheaths and last and most importantly increased interaction as a result of infant massage increases the bonding and attachment. As a Certified infant massage instructor I massage a substitute doll, "Destiny" to demonstrate the strokes to parents in a modeling behavior teaching style. Parents learn to recognize behavioral sleep states: quiet sleep, active sleep, drowsy sleep, quiet alert, active alert and crying states. Implications for child development are: increased communication, establishing boundaries and emotional attachments of which experts recognize three types of attachments: securely bonded, anxious/ambivalent, and avoidant. Infant massage is wonderful for all babies including: pre-mature babies, babies born to teen moms, orphaned/adopted babies, battered infants, babies born with birth defects and drug and alcohol exposed infants, infants that are HIV positive, infants that experience colic, sleeping disorders, low birth weight, motor disturbances, physical developmental and mental health disturbances. Massage has been proven to impact children who have asthma, autism, burns, and numerous other childhood illnesses. Adolescents, adults and elderly people have shown improvements under psychological and medical disturbances both when massaged and when giving massages. This need for touch has shown no indifference to the human stage of either development or maturation stages.